According to report by Transparency Market Research (TMR), the global adaptive optics market has highly fragmented landscape owing to presence of numerous players operating in the global market. Some of the key players in the market are Northrop Grumman Corporation, Boston Micromachines Corporation, Olympus Corp., Raytheon Co., IRIS AO, Inc., Canon Inc., Benchmark Electronics, Inc., Celestron LLC, Carl Zeiss Meditec AG, and Sacher Lasertechnik Gmbh. The top four players in the global market for adaptive optics, including Canon Inc., Olympus Corp, Carl Zeiss Meditech AG., and Northorp Grumman Corporation collectively accounted for 24% shares of the overall market in 2015. 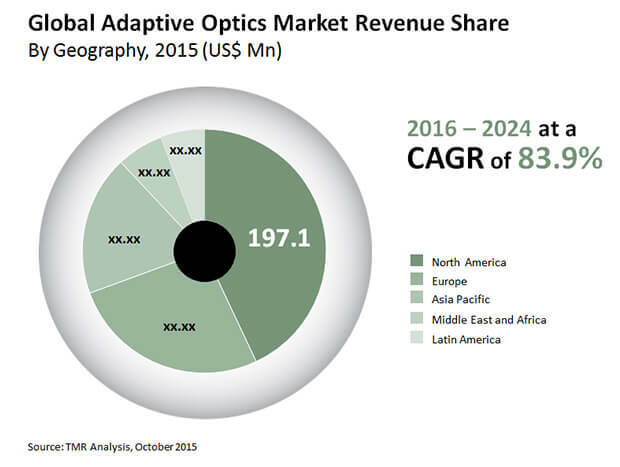 According to a report by Transparency Market Research (TMR), the global adaptive optics market is expected to expand with a CAGR of 83.9% from 2016 to 2024, to attain the value of US$28.49 bn in 2018 from US$10.968 bn in the year 2015. The segment of wavefront sensor dominated the global market with the dominant share of 45% in the global adaptive optics market in 2015. North America was the dominant market for adaptive optics in 2015 with account of over 40% share of the global market for adaptive optics. Adaptive optics is a technology integrated with the optical systems mainly for communications, beam propagation, and microscopy. Such technologies helps to enhance efficiency of optical system by reducing wavefront distortion effects. These optics have applications in laser communication, retinal imaging, and biological research. Increasing demand of adaptive optics for high-resolution microscopy, growing value for utilizing adaptive optics in free-space laser communications and utilization of adaptive optics for long-range target identification in military applications are some of the major factors predicted to fuel the adaptive optics market growth. Increasing use of adaptive optics in ophthalmology and retinal imaging is estimated to support the adaptive optics market significantly in years to come. Despite of these growth prospects, the factors such as high initial cost, complex designing techniques are limiting growth of the global adaptive optics market. Nevertheless, advancements in adaptive optics technology coupled with development in professional astronomy is expected to open new opportunities for adaptive optics market in the near future. Additionally, increase in investment in R&D field for integrating adaptive optics to offer a wide range of applications and development of lighter materials for adaptive optics is expected to offer lucrative opportunities to key players operating in the market.